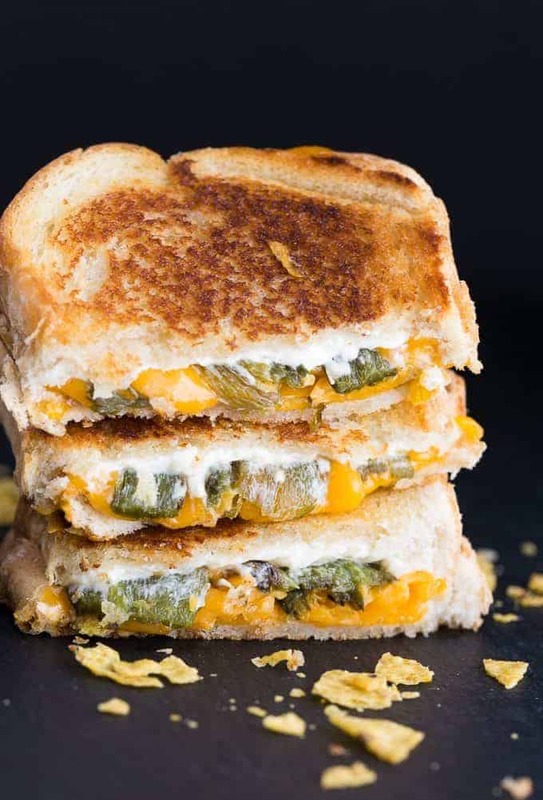 A Jalapeno Popper Grilled Cheese Sandwich will take your lunch to a whole new spicy level! This month I’m participating in the Crazy Cooking Challenge hosted by Moms Crazy Cooking and the theme is grilled cheese sandwiches. 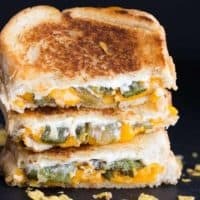 I found a recipe for Jalapeno Popper Grilled Cheese Sandwich on Closet Cooking that looked like something we would like. I love the flavours of Jalapeno Poppers and was curious to see what they would be like in a sandwich version. It’s fun to take a recipe and a little twist to it. I was blown away with how yummy this Jalapeno Popper Grilled Cheese was. The bread was buttery and crispy on the outside and inside was an explosion of flavour. The cream cheese, melty cheddar and spicy jalapenos were to die for. The tortilla chips added a crunch of texture. It turned out beautifully and John even asked for them again the next day! They are little bit more effort to make because you have to roast the jalapenos, but my gosh, they are SO worth it. I swear this will become your favourite sandwich once you give it a try. The first step is to roast the jalapenos. 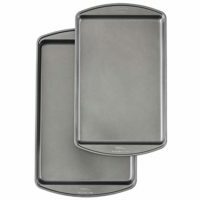 Place them on a baking sheet with the cut side facing down. Broil oven the top shelf until the outer layer of skin has blackened, about 10 minutes. Place the peppers in a plastic ziploc back and seal. Let them cool for 20 minutes. Remove the skin of the jalapenos by pinching them off. Butter the outside of each slice of bread and spread cream cheese on the inside. Top with two jalapenos and then sprinkle on cheese. Add crumbled tortilla chips and then the other slice of bread. Cook on the stove at medium heat until outside is golden and the cheese is melted. I had to share the sandwich cut so you could see the ooey gooey-ness of the inside. My mouth is watering now! This sandwich is a little more effort to make than a regular grilled cheese sandwich, but I promise that it’s SO worth it. I have several grilled cheese sandwich twists on the blog. Caramel Apple Grilled Cheese Sandwich: One of the most delicious dessert grilled cheese sandwiches you’ll ever have! Honey Banana Grilled Cheese Sandwich: Elevate your breakfast with a sweet sandwich your family will love! Taco Grilled Cheese Sandwich: Celebrate National Grilled Cheese Day by taking two recipe favourites and combining them into one mouthwatering sandwich! So easy. So good. Blueberry Brie Grilled Cheese Sandwich: Yes, lunch can actually be a dessert! Enjoy the decadence. What are your favourite grilled cheese sandwiches? Take your lunch to a whole new spicy level! Place the peppers on a baking sheet with the cut side facing down. Place the baking sheet on the top shelf in the oven and broil until the outer layer of the skin has blackened, about 10 minutes. Place the peppers in a zip-lock bag and seal and let them cool for 20 minutes. Remove the skins from the peppers by “pinching” them off. Butter the outside of each slice of bread and spread the cream cheese on the inside. Top with two jalapenos and then sprinkle on cheese. Add on crumbled tortilla chips and then the to other slice of bread. 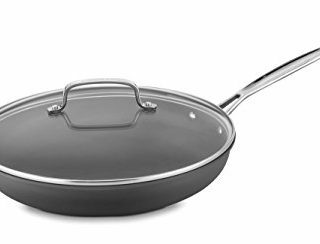 Cook in a non-stick pan on the stove at medium heat until outside is golden brown and the cheese is melted. Love jalapeno poppers and love the idea of it on a sandwich! Great idea with the tortilla chips too! Oh my goodness! I never would have thought of any of these Grilled Cheese Sandwiches. I want to try a lot of them now. Thanks for Sharing. Welcome to the CCC! Great choice for challenge. Hubby loves Jalapeno Poppers so I know he’ll love this sandwich! I almost chose this same sandwich–it looks and sounds wonderful! What a great choice for the CCC! I made the same thing! I guess great minds think alike. 🙂 Yours looks fabulous. 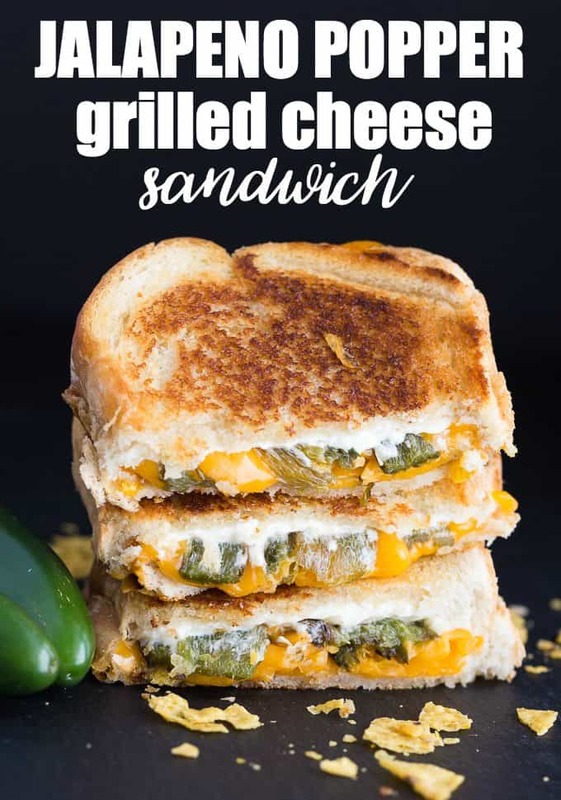 I love the Jalapeno combination for your grilled cheese, it looks awesome! Hubz would LOVE this! Thanks! Putting the chips on is so clever!! 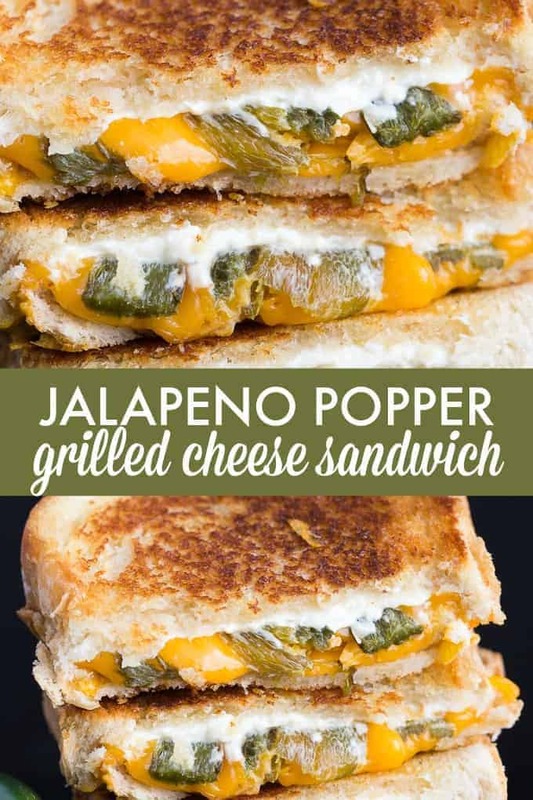 I have just discovered lately that I love cheese stuffed Jalepenos so this sandwich looks down right delicious to me!!! Thank you for sharingI love that there are crumbled tortilla chips in it too. I love sandwiches and am always trying to find fun new ideas, thanks! I love this sandwich and make it often.I got the recipe right here and so thank you.The halepeno peppers are a great way to nip it up! Love it!!! I feel liked everything you make is quite possibly the cheesiest, most best thing I have ever seen! I love the addition of tortilla chips in this sandwich! Very creative and indeed tasty, Thanks! OMG I’m literally drooling over my laptop here! This sounds (and looks!) AMAZING, Stacie! I’m definitely going to try it! What a delicious looking sandwich! We love poppers so we are sure to love these! I’m a huge fan of grilled cheese sandwiches and that one looks absolutely delicious! I will definitely have to give it a try soon!. I followed you here from Miz Helen’s Full Plate Thursday. Have a beautiful day! Oh, these are SO lunch tomorrow! And as a side note, this should not be read my someone surfing in bed with the midnight munchies! Thanks, they sound amazing! Oooh! This looks so good! My husband would be thrilled if I made these. This looks so good! I saw it on Saurday Sharefest, and I can’t wait to try it! Oh my, wish is had one right now. Your sandwich looks scrumptious. Thank you for sharing your recipe at the Snickerdoodle Create~Bake~Make link party! I love the Jalapeno combination,bet it’s delicious ! I love grilled cheese! This recipe sounds absolutely perfect. Gotta try this soon – like this week. These are so delicious! Tried them a second time with added fresh pieces of cooked bacon since poppers often are wrapped with bacon. 🙂 Yummy! !